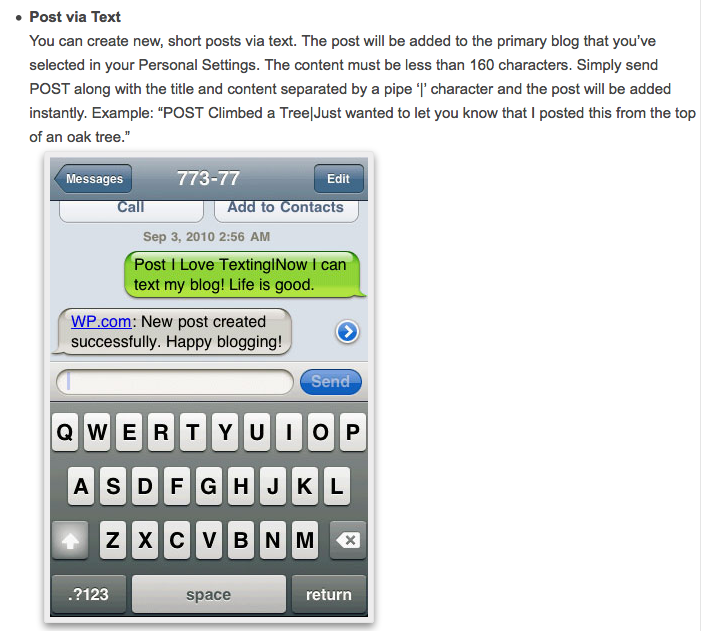 WordPress continues to improve ways bloggers can post to their blogs first by email and then by voice now by text. Case in point, for an extra $20 a year blogger can post to their WordPress blogs via text message. The two previous alternative WordPress posting methods – email and voice – were added at no additional cost. I have used both but prefer posting the old fashioned way – via laptop and browser. However, text posting looks interesting and I might consider adding it to one of my blogs in the future to give it a try. This entry was posted on October 11, 2010 at 4:40 pm and is filed under Post To Wordpress Via Text Messaging. You can follow any responses to this entry through the RSS 2.0 feed. You can leave a response, or trackback from your own site. Would like to blog from India while I’m there next week…after looking at my text messaging plan vs data plan to roam from there, this may be an economical option!